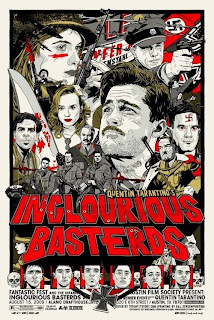 Inglourious Basterds continues to round out the case that Quintin Tarantino is one of the greatest movie directors of all time, right up there with the likes of Alfred Hitchcock, Oliver Stone, Stanley Kubrick, Woody Allen, Steven Spielberg, and Victor Fleming. Perhaps the movie's most powerful scene is the slow-builder tension of the opening sequence, in which a Nazi colonel known as "The Jew Hunter" (an award-deserving Christoph Waltz) visits a family in France to make sure there is no harboring of Jews on the property. From there, we follow this wicked and charming colonel as he faces off against American Lieutenant Aldo Raine (a typically awesome Brad Pitt), who leads a group of Jewish-Americans on a mission to kill as many Nazis as possible. Also of note is the stunning and magnetic Melanie Laurent as a Jewish girl who is living under an alias in very close proximity to many of the top-brass Nazis.